The Society recognises that a number of other local organisations do important work, for example helping to conserve the natural environment, preserving or enhancing buildings, providing community facilities, or fostering education. From time to time, it makes donations in support of such projects, where their achievement can be linked to the Society’s objectives. Each year from its current account, the Society contributes towards the cost of such projects. Major donations (£500 and above) have been largely directed towards building projects, such as the Flavel, but smaller donations (from £50) have been made toward a wide range of initiatives. 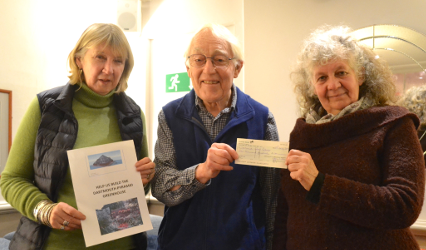 The Dartmouth & Kingswear Society was delighted in 2018 to announce a recent donation of £1,000 to Dartmouth Green Partnerships for the Pyramid Community Greenhouse. The Society’s Vice-President, Phil Charlesworth (centre), said: ‘The D&K is very pleased to be able to support local worthy causes such as this for the benefit of the community. It is one of our core activities’.